Pattern-making is a required fashion design degree course. Beginners as well as intermediate pattern-making students can work with existing shirt patterns to become acquainted with pattern alignment, cutting and stitching. Making an original basic button-down shirt is challenging. The collar must fit comfortably around the wearer’s neckline, and the sleeve must also include fit and ease for comfortable movement. Using an existing pattern as a base allows the pattern-maker to make adjustments according to the desired design and silhouette. Draft the button-down shirt pattern on pattern paper. Draw the initial pattern outlines with drafting pencils, using a ruler for straight lines and a French curve ruler for shaped lines. The basic button-down shirt pattern parts consist of a collar, the collar band, front placket, front and back panels, the sleeve and sleeve cuff. A chest-pocket pattern is optional. The front placket is the button-down shirt’s main feature. It is a vertical piece stitched at the center of the shirt, generally made of a double layer of fabric. The buttons and button-holes are evenly spaced apart and stitched onto the front placket. Mark the necessary notches at the front and back of the sleeve as well as on any pattern parts requiring stitching alignment. Notches are cut markings on a pattern made with a notcher tool. The markings are then transferred onto the fabric and act as a stitching guide indicating fabric part alignment prior to construction. Mark the pattern with fit details such as front and back darts. This is especially important if you are making a fitted or contoured women’s button-down shirt. Darts are generally located below the bustline as vertical inserts. The dart pattern markings appear like elongated diamond-shaped inserts, which are stitched together, forming the shaped contour. Cut out the pattern parts with sharp paper scissors to avoid jagged edges. Make sure the patterns include 1/2-inch seam allowance, especially if you are working an existing pattern. Advanced patterns often do not include the seam allowance in the pattern. Fold the fabric selvage to selvage, located at each end of the textile. The selvages often appear warped and rough to the touch. Folding the fabric correctly ensures that the fabric parts are cut along the natural grain line of the fabric. Certain pattern parts, such as the back pattern, are cut on the fold line. Have a minimum of 2 to 3 yards of fabric on hand for the project. Pin the patterns with straight pins onto the fabric. If you are making a button-down shirt out of delicate fabric such as satin or open weave textiles like linen, make sure to use sharp straight pins and pin only within the seam allowance area. This reduces visible pinholes throughout the seams. Use ballpoint pins for knit-inspired shirts such as jersey/Lycra blends. Cut the fabric parts with fabric scissors to ensure smooth seam lines. If you are making a tailored shirt, the reverse side of the shirt is cleanly finished with smooth seams. Techniques such as French seams are usually implemented on straight seams encasing the raw seams. The right side of the fabric is stitched first, turned in and then stitched on the wrong side. Mark the placket for button and button-hole placement with an invisible fabric pen or tailor’s chalk. The markings are evenly spaced apart such as 1½-to-2-inch spacing. 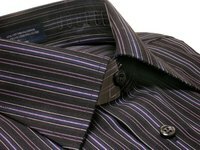 Generally, a button is placed at the collar band, which is an added piece around the neck. The fold-over collar is attached to the band, resulting in a clean collar roll around the neckline. This is especially important if you are making a men’s button-down shirt for necktie use. Mark the button and button-hole placement on the sleeve cuffs. If you designed wide cuffs, such as French cuffs, an alternative is to use several buttons tightly spaced apart for a dramatic cuff finish. Pin the fabric parts together and fit on your dress form. Make sure the button and button-hole placements are aligned. This ensures an even-buttoned front panel hem. Try on the pinned shirt carefully for fit and ease. Run each pattern piece through the overlock machine to finish the ends. The overlock stitch prevents fraying and reduces the sideseams from raveling. Machine-stitch the fabric parts. Make sure you are working with the appropriate sewing machine needle to avoid punctures into delicate fabric. Stitch seams from the center of the shirt out or from top to bottom. For instance, the shoulder seam is stitched from the high point shoulder to the armhole. This ensures that any excess fabric at the armhole produced by improper cutting is evenly cut away. The sideseam is stitched from the top armhole point to the bottom hem. This ensures that any excess fabric at the front or back panel is cut away for an even bottom hem finish. Change the sewing foot attachment to the button-hole attachment. Older machine models require you to use the reverse stitch button to complete the button-hole and bar-tack the ends to close. As an option, practice a few button-holes evenly spaced apart on a piece of fabric scrap. Keep in mind that the button-hole center is slashed with a scissor to insert the button. Another option is to use a buttonholer machine attachment, which has a buttonhole template for accuracy. Attach the buttons with a hand sewing needle and thread at the front placket and sleeve cuffs. Mark the button placement by overlapping the slashed button-hole over the button area. Use a disappearing-ink pen to mark the button. Cut away all loose threads prior to wearing the button-down shirt. Use a felt-tip pen to draw the shirt pattern outline and details when the patterns are finalized. 4 very different ways to wear that white shirt in your closet - making it the hardest working item you could own.